NOTE: this post was expanded and corrected August 6th, 2014. It’s a kind of note-taking for an essay of mine on Guardians of the Galaxy to be released in a forthcoming anthology dedicated to Marvel’s Cinematic Universe. If you’ve seen the latest, massively fun addition to Marvel’s Cinematic Universe, Guardians of the Galaxy, then you know its cheesy and endearing mostly 70s and mostly soft rock soundtrack is almost like another character in the film. Some scenes verge on being mini music videos. The main character, Peter Quill (a.k.a. Star-Lord) was abducted from earth as a child the day his mother died (in 1988), taking with him two mixtapes made for him by his mother: “Awesome Mix Vol. 1” and “Awesome Mix Vol. 2.” Though the abduction took place in 1988, the songs are exclusively from the 60s and 70s because they’re songs Peter’s mother grew up loving. She’s passing along pieces of her childhood to her son through this music. This soundtrack deserves special attention, because according to the director at least some of the film’s score was written first so that the film could be shot to the music rather than the music scored for the action. Director James Gunn calls Quill’s Walkman an “umbilical cord” connecting him to earth, which associates it very closely with his lost mother and with the maternal and with nurturing in general. I don’t know if people are still making mixtapes (which would now be either CDs or iTunes or Spotify playlists), but they used to be — potentially — very carefully selected and arranged songs that combine mood and message through music. Sometimes the mood and a single thought is all there is to it: sometimes they’re just collections of songs that people like. At one time mixtapes were a subtle and less-threatening way of telling someone how you feel about them. Since the tapes in the film were made by a mother for her son (the second one made when she knew she was dying), I thought it’d be interesting to see what all of the songs together sound like. So I’ve gathered together the music on these mixtapes and embedded YouTube videos of the songs below in the order in which they appear in the film. Rules of the game: Song lengths are taken from the Wikipedia page for individual songs. If I list two song lengths below, the longer version of a song is the album version while the shorter version is the single version (released for radio airplay). If a song length is shown in italics, that’s the length on the Guardians soundtrack. Differences of a second or two may only be differences in the length of the silence before or after a song, but some song lengths on the soundtrack are significantly different from either the single or album versions of the songs, so the soundtrack is using different edits of these songs. In 1988, the most music you could usually fit on a single cassette was 120 minutes, 60 minutes per side. Cassettes also came in 60 and 90 minute lengths, cutting side lengths to 30 and 45 minutes, respectively. CDs had been available to the public since about 1982, but people were still using cassettes quite a bit in the late 80s. Almost no one was able to burn to CDs yet, so if you wanted a mixtape, it had to be on cassette, and while most people didn’t have CD players in their cars yet, many did have cassette players in their car stereos. Finally, I’m unsure if this is the order of the songs on the tape itself. The film occasionally shows close-ups of the Walkman that Peter Quill carries around, and the tape position can give some hints about the real song order if the filmmakers were paying attention to detail on that point. Based on the opening scene, “I’m Not In Love” should be somewhere about 1/3 of the way in on the tape reel, so it wouldn’t actually be the first song. This song is about 15-20 minutes in on the soundtrack, which would place it about 1/3 of the way in on a 60 minute tape. I’ve added descriptions of the scenes in which the songs are being played, so watch out for spoilers. The order below is the order in which the songs are listed in the closing credits of the film; i.e., the order in which they appear in the movie. There’s no reason to believe that the movie order of the songs is the mixtape order of the songs, of course, and the order below does not match the order of the songs on the soundtrack, which may represent the filmmaker’s imagination of the order of the songs on the mixtape. But at the same time, the soundtrack does include “Awesome Mix Vol. 2” songs in the Vol. 1 CD (they should at least be listed last, but they’re not), and it also includes Norman Greenbaum’s “Spirit In The Sky,” which was used in the trailer but not in the soundtrack. It could still be on the mixtape, of course. The order on the CD, therefore, is most likely random. 1. 10CC, “I’m Not In Love” (6:10 or 3:42, 6:03, 1975): Peter Quill as a child waiting to be called in to his mother’s hospital room as she’s dying in bed. Opening scene of the film. This song may reflect the child’s attempt to deny his grief at his mother’s impending death. 2. Redbone, “Come And Get Your Love” (4:27, 3:26, 1974): 26 years later. Peter Quill as a 30something adult walking through the ruins of the planet Morag to retrieve an orb for payment, singing along and kicking wicked looking rodents as he goes. Second scene in the film, plays to opening credits. The words “Come And Get Your Love” may serve as an ironic reference to Peter recovering the orb itself, which becomes the most important object in the film, equivalent to the Tesseract of previous Marvel Cinematic Universe films such as Captain America and The Avengers. The title may be referencing the orb as his “love” because it’s a means to his freedom and independence, or it may reference the fact that the orb will lead him to Gamora, a future potential romantic interest. 3. Raspberries, “Go All The Way” (3:10, 3:21, 1972): Peter is escaping from Morag with the orb, and as he is escaping he confronts his former boss, the space pirate (Ravager) Yondu about the orb. Yondu had made his own arrangements for selling the orb at considerable profit, but Peter is now acting on his own. “Go All The Way” may refer to Peter stepping out on his own to sever bonds with the past and with Yondu in order to establish his own future. 4. Blue Swede, “Hooked On A Feeling” (2:48, 2:52, 1974): Peter Quill has been arrested, interred in the prison Kyln, and then gets beaten and tortured with something like a cattle prod as he tries to retrieve his Walkman from an alien guard in the prison impound room. The volume of the song swells up just as Peter starts to be tortured and then continues at this volume as he is hosed down and given prison clothing to wear. The title “Hooked On A Feeling” may refer to the prison as a metaphor for his past life: Peter has been a prisoner his whole life. He’s just repeating the cycle here. He knows this feeling. 5. Rupert Holmes, “Escape (The Pina Colada Song)” (4:34 or 3:50, 4:37, 1979): Not hard to predict this one. This song plays as Peter escapes the prison with the group of aliens that would come to form the Guardians of the Galaxy team: Gamora, Drax, Rocket Raccoon, and Groot. 6. David Bowie, “Moonage Daydream” (3:52, 4:41, 1971): The Guardians (but they have not yet identified themselves as a team or even congealed as a group) arrive at a gargantuan (moon-sized) severed head of an ancient cosmic creature that is now a criminal outpost/mining colony called Knowhere. The purchaser for the orb is there. This song is the only explicitly space-based song in the film, originally recorded in 1971 by David Bowie with the band Arnold Corns. It was rerecorded and rereleased on Bowie’s solo album The Rise and Fall of Ziggy Stardust and the Spiders from Mars in 1972. 7. Elvin Bishop, “Fooled Around And Fell In Love” (4:35 or 2:59, 1976): While the team is waiting on Knowhere to meet the orb’s buyer, Peter Quill explains the importance of the Walkman and its music to the only female member of the team, Gamora (perf. Zoe Saldana). She’s young and green, and until this moment in the film has acted entirely and only like a hardened killer. 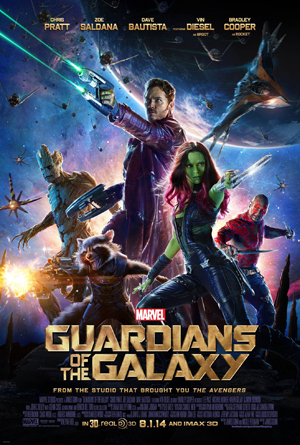 While listening to the music, however, she softens to Peter and almost kisses him, but then draws back from him and holds a knife to his throat to ward off what she calls his “pelvic sorcery.” However, the song’s title also foreshadows the possible future relationship between Gamora and Peter Quill. 8. The Runaways, “Cherry Bomb” (2:19, 2:17, 1976): The orb was captured by Ronan in space outside of Knowhere. This song plays as the Guardians prepare for battle to retrieve the Infinity Stone contained within the orb before Ronan can use it to destroy the home planet of the Nova Empire, Xandar. It’s an aggressive hard rock song appropriate for an impending battle. SIDE TWO if it’s a 60 minute tape (29:00): otherwise all songs are on side one. Judging from the reel thickness I’m fairly certain the tape is at least a 90 minute cassette. 9. The Five Stairsteps, “Ooh Child” (3:11, 3:14, 1970): Near the end of the film. Ronan has landed on the Nova Empire’s home planet and is about to destroy all life on it using the Infinity Stone placed in his hammer (he carries a large battle hammer on the end of a long staff). Peter Quill and the Guardians have crash landed and this song is playing over the remnants of the stereo that was built in to Quill’s ship. Quill starts dancing to this song in front of Ronan, challenging him to a “dance off” as a distraction until Rocket Raccoon can destroy Ronan’s hammer with an improvised gun. The lyrics, “Ooh child things are going to get easier / ooh child things will get brighter” foreshadows Ronan’s defeat. Total time for Awesome Mix Vol. 1: 32:14 using the soundtrack versions of the songs. We may not have even used up the first side of either a 90 or a 120 minute tape using any versions of the songs. But since it’s a mixtape, the tape doesn’t have to be fully used. There may or may not be more music on it as far as the movie is concerned, but of course as you see from the link above the Director’s mixtape had considerably more music on it. The mixtape starts, then, with the death of Peter’s mother and ends with the defeat of Peter’s enemy. 1. Marvin Gaye and Tammi Terrell, “Ain’t No Mountain High Enough” (2:28, 2:29, 1967): Peter Quill has finally opened the present and read the card that his mother gave to him on the day of her death. Her present was a cassette labeled “Awesome Mix Vol. 2.” He pops it in and begins to play it. This is the first song, very likely signifying Peter’s future ambitions and the fact that he is now able to have them. As a song from his dying mother, it’s both a goodbye, a wish for his future, and a promise to always somehow be with him. 2. Jackson 5, “I Want You Back” (2:59, 2:58, 1969): This song comes on as Peter and the Guardians are getting ready to blast off from Xandar in their reconstructed ship. As a song from Peter’s mother, it’s a love song that reflects her feelings for him and the feelings she knows he will have for her. And for the record, in the film, aliens just love this music. 1. Norman Greenbaum, “Spirit in the Sky” (4:02, 1969).